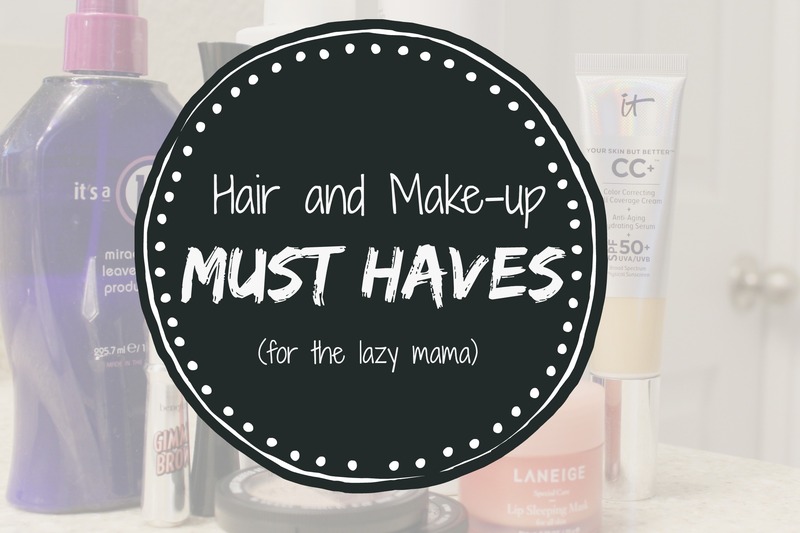 Hair & Makeup Must Haves! There are two things you may or may not know about me. I am high maintenance with my hair and makeup, but I like a simple look. I tend to be rather lazy. Yeah, I know. It’s a strange dichotomy. What can I say? I’m complicated that way, I guess. All the more reason to pay attention, though, when I recommend products! If I’m lazy, I’m not going to use a bunch of junk that takes a lot of time or multiple steps. Nope, I like to keep things as simple as possible. So, without further ado, here’s what I’m using and loving right now. Let’s just restate the obvious, shall we? I have gray hair. Gray hair that has always been wavy. What does that mean for my product choice, though? Well, it means that my hair is super coarse and pretty dry. Now, this has it’s positives and negatives. On the upside, it means that I can get by with only washing my hair 2, maybe three times a week without it looking or feeling greasy. The downside, though, is that it tends to get pretty darn frizzy in the humidity. The it’s a 10 miracle leave-in product is great for the frizz! I spray it on my wet hair and comb it through. That’s it! It seriously cuts down on the frizz factor and acts as a leave-in conditioner to keep my hair soft. It also works great as a detangler for my sensitive-headed 6 year-old after washing her hair! Bonus! The two Paul Mitchell products are what give my hair the staying power I need to stretch out those shampoos. The Invisiblewear Memory Shaper is what I use on wet hair. Just a nickel-sized amount worked through my hair acts as a styling agent whether I want to blow dry it straight or wear it wavy. Then, by some crazy magic, it really holds the style well! My waves stay, even after sleeping on them, and the straight stays (at least mostly) straight into the next day! The Undone Texture Spray is part hairspray, part dry shampoo. Sprayed on the roots, it adds volume to dry hair, but when I spray it on my bangs, I get the piece-y look I like and the hold I need. These four items (plus some lip gloss) are what I wear just about every single day. They range in price from just under $10 to $50. I have been using lashblast FUSION mascara for years and years. And I have yet to find a mascara that does as good a job at combining volume and length! It layers well and doesn’t get clumpy. For reference, I use Very Black, but it comes in several different shades. benefit’s Gimme Brow is a new find, but I absolutely love it! See, my eyebrows grow in really funky…hairs growing in every possible direction. This stuff is awesome because it’s got a mascara-wand-like head to comb hairs into place and just enough tint to fill in any sparse patches. Love it!! IT Cosmetics Superhero eyeliner is a dream! It’s a liquid eyeliner with a superfine point that you can make thicker just by applying a little more pressure. It’s precise and doesn’t run at all. It is honestly the first eyeliner that I have been able to use successfully without looking like a raccoon or a 12 year-old had applied it. IT Cosmetics Your Skin But Better CC+ cream has been a total game changer for me. I have rosacea and looked for years for a foundation that would actually cover it up and even out my skin tone. Well, this does it. Totally. And, while I had a bit of sticker shock at first, I will tell you that one tube lasts forever! In one year, I went through only three tubes. 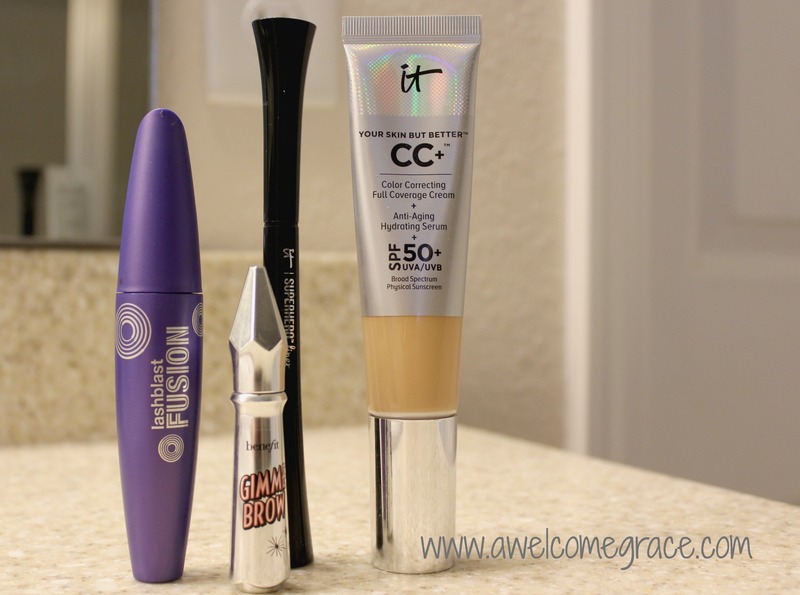 In the “you get what you pay for” category, IT Cosmetics is a winner! 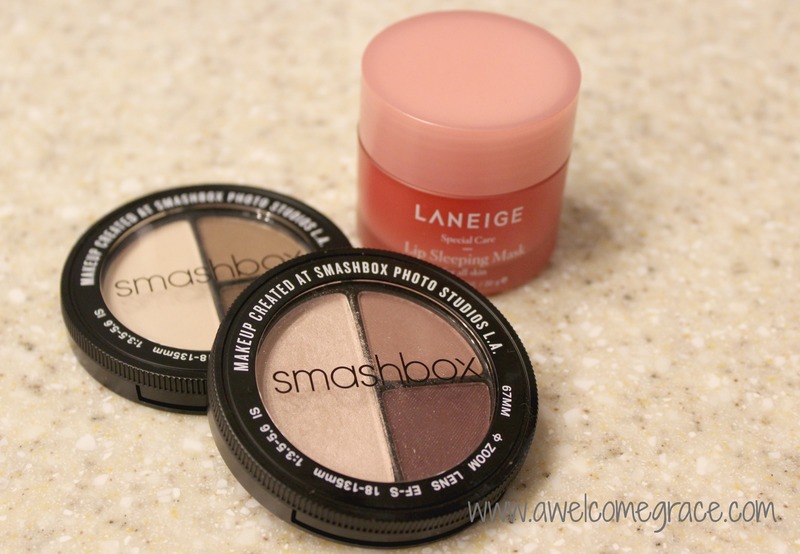 Smashbox eyeshadows. Look into them! Perfectly coordinated colors for a put together look. Instructions on exactly where to apply what color. Lazy moms everywhere, rejoice!! Laneige Lip Sleeping Mask. This one pulls double duty. It’s a great mask for your lips at night to keep them super soft, but you can also put a tiny bit on top of some matte lipstick to keep your lips from drying out and to add just a teensy bit of shine. OK, friends! There you go! Hope you found something you liked or that could help you out. Now, share with me! What are your go-to must haves? Drop me a comment! **Disclaimer — these are affiliate links to Amazon. Check the disclosure page for more info. This is a good one!! I love to hear about products people use. I am checking out those hair products! !